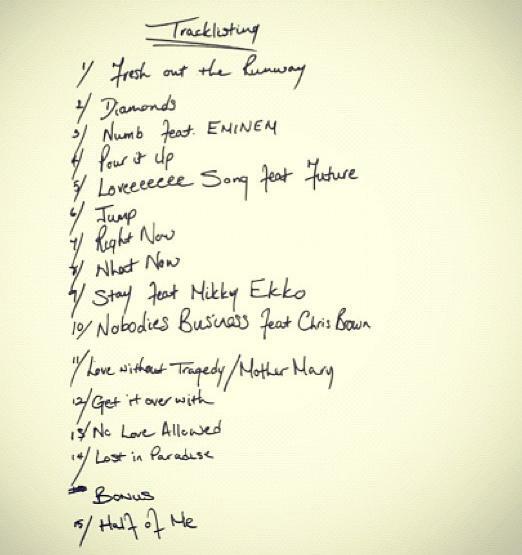 KayKiSpeaks.com: @Rihanna Drops Album Track list and Snippets! Ohhh Navy, how exciting is this?! Le Queen as yall call her dropped her album tracklist today. Rihanna landed in New York looking casually cute for Victoria Secret Fashion show this Wednesday rocking Chris Brown's BP label pink snapback. We've all been waiting on Unapologetic for a few weeks. We've been ready to hear what this new found freedom and resolve would yield from Rihanna. Well, we finally got a tracklist and we know song titles along with who Rih has featured on this highly anticipated album! For starters we know she's got her friend Chris Brown on a record called Nobodies Business, that should be a popular one! Then she re connects with Eminem on a record called Numb that I can exclusively tell you is produced by the same team responsible for Chris Brown's Bassline, Nicki's Right by My Side, and a slew of other hits.. GOOOOOOOO!!! MUSIC so their track record is proven! Rih also has a record with Mikky Ekko who is insanely dope, and Future who needs no introduction! This album is gearing up to live up to the hype! The album drops in just a few days! November 19th! That Rihanna reign continues! To hear a sneak peak follow the below instructions in your itunes. Go to the main page of your iTunes store. Top of iTunes select View-> View Column Browser -> Music-> Pop-> All-> Rihanna-> Unapologetic!